So yeah, holy crap do I think this is good. I commissioned this from Les McClaine a few months back when he was doing his Week (and then some) of 100 Drawings. 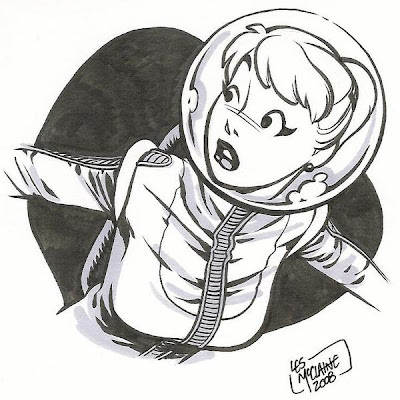 My only instructions were "Cute retro space girl, bubble helmet a must." To say this exceeded my expectations would be an understatement. Les just absolutely crushed this one. She looks like Betty Cooper... IN OUTER SPAAAAAAAAAAAAACE! What's not to love here? And he did a great job on the one I commissioned for my son, too. But I'll save that for another time.